Seaonal item, they came in and wife picked them when shopping today, she noticed they were there. $6.99 for the set. They are 8mm, 13mm, 18mm, 24mm chisels. Nice handles, while they are sharp out of the packaging, they will of course need to be honed. So, I have been given the all go by the doctor to get bak in the shop. 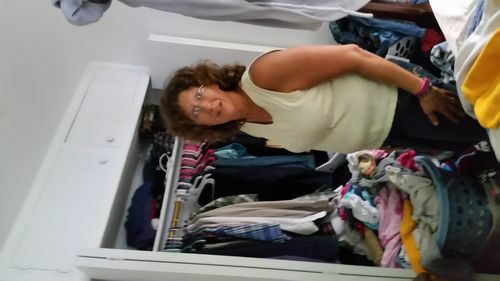 I have not benn able to do so for about 11 months due to the cold weather we had and then when I incurred a medical issue in March.of 2017. Will update after I get a chance to hone them and use them. Ha! I got some too. In IL. Picked up 2 packs. The legendary Aldi chisels made famous by Paul Sellers. I must say I was disappointed to find them Metric but o well. I have plenty of imperial chisels. I’m going to have to try Aldis for more than groceries! Mine were sharp unpacked. You can see the milling marks but they will come out after honing. Nice chisel weight, mm vs inches still usable. Wife remembered them fortunately. Just picked up 2 sets. Had to go to two Aldi’s to find any and the last place only had the two sets. So I took them both. I see they’re made in China, and if I recall these were made in Europe at one time, but I’ll give one set a shot and see how they stand up. For 6.99, you just can’t go wrong. Same as the others, went to my local Aldi and bought the last three sets.. one was for a friend at work, the other two Im keeping. I was impressed with how big these things are. I was expecting short handled mini chisels. These are full size with good weight. good enough for bench chisels anyway! Stopped at Aldi on the way home, they had 4 or 5 sets on the shelf. I picked up a set….I mean for $7 you can’t go wrong even if they turned out to be beaters. 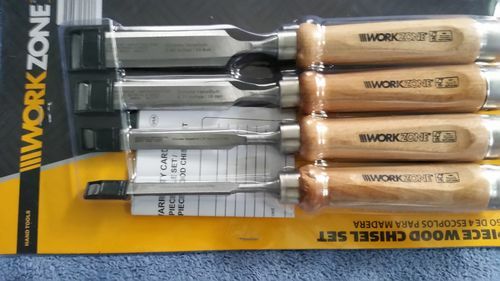 I hope they work out for all of you, usually I find cheap chisels don’t work to well but I have seen some good reviews on a low-cost HF chisel sets so who knows the Aldi’s might be a good too. I’m not really a woodworker. Especially not an experienced one. But I bought the Aldi (large Paul Sellers fan!) and also some of Cherries (bought them used, but they were obviously unused). I have already done some work with both types (e.g. my workbench) and like to use them both. Although I have a guide, I use the freehand sharpening method Paul Sellers also introduced. This works very well for me. The final treatment on a strop makes a huge difference! I can really recommend the Aldi chisels.